Noted Egyptologist, Miles Cramer, ran his hand lightly over the dusty veneer of the three-thousand-year-old wooden sarcophagus, trying to read the disjointed hieroglyphics on it. Miles and photographer, Ajib Anwar of the Supreme Council of Egyptian Antiquities were in the tomb of a long-dead queen, who to all purposes was banished and dishonored by her people millennia ago. “Perhaps the hieroglyphics on the sarcophagus will tell us why,” Ajib suggested. Bats whizzed around them as the two men peered at the faded markings etched on the ancient wood. Ajib held up a large strobe light for them to see better in the dingy gloom of the tomb. Several of these winged, nocturnal creatures clung to the sharp, rocky edges inside the makeshift mausoleum. If the men were lucky, the more indolent of them would not zigzag around them, and would leave them to their task. The temperature in the tomb soared to 130 degrees Fahrenheit by Miles’s estimation. Sweat poured down the faces of both men as Miles ran his hand over the markings. Despite the intense heat and the vile, musty odor the men concentrated on the sarcophagus. “The hieroglyphics show that Queen Nilofer was banished during the 12th year of Smenkare’s reign,” the Egyptologist muttered, straining his eyes to study the etchings despite the glare of the strobe light. Miles didn’t reply. He concentrated on the figures etched on the sarcophagus and started muttering again. “It shows the figures of a man and a woman together, Nilofer and this man. Apparently she betrayed the Pharaoh with this man, or so the hieroglyphs say. Perhaps adultery. It also says here she was beloved by her husband and she shamed him. He did not have it in his heart to have her executed,” Miles said. He took out a soiled handkerchief from his safari shirt pocket and wiped his face. that jutted out from the wall. “Not only that,” Miles said. “She probably perished in the desert from heat and starvation.” He sat back on his haunches in the sand that constituted the floor of the tomb. “You notice this tomb is at a distance from the Valley of the Kings where all the pharaohs and consorts are buried,” Miles said. “Nilofer brought dishonor to the Pharaoh and his court so she was given the burial of a pauper.” He glanced around at the paraphernalia of the after-life – stools, plates, barley, drinking cups, clothing – but these were items that not even the poorest peasant would claim to own, pitiable trash thrown at a mendicant. Ajib set up a tripod and placed a titanic-sized piece of equipment, a state-of-the-art camera that could easily double up as an AK 45, and he started clicking noisily. The noisier the camera, the more cutting edge, Miles thought with a wry grin as he glanced up briefly. Miles painstakingly ran a small brush over the hieroglyphics in short, deft strokes, trying to remove the dust of millennia. Miles gently extracted the cloth from the palm of the mummy through a hole near the wrist. Nilofer’s mummy was not in the best state of preservation. Miles placed the cloth and seeds in a plastic bag he pulled out from his pocket. What seeds were they and who had put them in her hand, as if to accompany her in her journey through eternity? He’d have to examine the seeds and see if he could identify them. They could provide a clue to understanding this enigmatic woman. Ajib had stopped clicking and was putting away the equipment in heavy-duty carrying cases. He turned toward Miles who contemplated the seeds. “What do you have in your hand?” Ajib asked Miles. Ajib scrutinized them as they lay in Miles’ palm. “They look like coffee beans, smooth and dark brown,” Ajib said shining the strobe light on them. Miles nodded, then looked around at the dismal disarray of the tomb and felt pity for the woman buried in it. “Okay,” Ajib said and hefted his equipment out of the crawl space in the tomb with Miles following at his heels. Outside the harsh, white glare of the sun beat down on them, causing them to squint. Miles put on his shades and cap. The red bandana around his neck was now soaking wet. He removed it and stuffed it in a side pocket of his carryall. He patted the plastic bag with the seeds in it lying safely in his shirt pocket. Back at the hotel, Miles took a closer look at the seeds and then consulted a source book on rare plants of Africa. Despite pouring over it for over an hour, none of the plants and seeds he scanned looked like the seeds he held in his hand. His eyes had been watery all day—from the glare of the strobe light or from concentrating too hard on the etchings, he didn’t know. He closed them now and felt himself drift away into waves of sleep. But it was a fitful sleep, earning him no rest. Strange images arrested him as he lay there. He saw a large, cavernous hall where priests were bent over a macabre task: of mummifying a corpse. Huge canopic jars stood nearby awaiting the organs of the deceased. He couldn’t see who the mummy was. One of the priests squatted on the floor consulting the Book of the Dead, the handbook for rules to guide the deceased through eternity. Suddenly the corpse arose and lunged toward Miles, but he still couldn’t see its face. A gaping hole showed where the face should have been. He awoke in a cold sweat, and sat up, his heart thudding in his chest. He didn’t know what to make of the images that had so startled him. The wraith of the vicious creature that had plunged at him seemed like a mummy, but somehow it didn’t seem like the mummy of Nilofer. There was something uncouth and gargantuan about this one. He shook his head and looked around the room taking comfort from the common everyday things in it. His backpack of notes and manuals, his laptop, a functional digital camera, bottles of drinking water, the small refrigerator that the hotel thankfully provided. Miles spent the rest of the afternoon pouring over his notes, still trying to identify the seeds. No luck. He glanced at the seeds on the table. Were they shrinking in size or was he still in the grip of the bad dream? A call from his wife, Elaine, in Pennsylvania broke the tedium of the day. She missed him and when was he coming home? In a couple of weeks, he told her. She’d understood that he’d have to travel when they got married three years ago. Forty years old was late for a guy to get married, but his work was as demanding as a spouse, and Elaine competed with his work sometimes, much to his wry sense of irony. Sometimes she’d accompany him, but not often. She was the owner of a boutique in Philadelphia and she couldn’t leave her work. Elaine’s phone call left him both homesick and desperate to finish his quest of identifying Nilofer’s history. He’d then turn over the excavation to the Egyptian Supreme Council of Antiquities and head home to Pennsylvania, back to teaching at the archaeology department at the university. The next day, all hell broke loose. The media, both Egyptian and U.S. got wind of the excavation and demanded to know who the mystery mummy in the tomb was. Was there a mummy? Or was this hype perpetrated by the Egyptian Antiquities Authority and the archaeologist from America? Ajib joined Miles at the hotel to go over the day’s excavation activities, and Miles told him about the furor that broke over the discovery of the mummy of Nilofer, and the demand to know the veracity of the news. “I could show them the photos I took yesterday to let them know that we indeed have a discovery,” Ajib said, setting the heavy equipment on the hotel room floor, then he open the cases one by one and set the lenses on the table. Obviously, he was on a mission to set the media straight about the excavation even thought he and Ajib didn’t need to convince anybody about anything, just bring the valuable find to light and give it the recognition it deserved. Ajib rolled his shoulders to relieve the soreness of carrying the equipment, and then proceeded to look for the pictures he had taken. Ahib’s shoulders went slack and he seemed to relent—for now. “Did you find out about the seeds? What are they?” he asked peering at them at close quarters. “Not yet.” Miles got up from the table. “I just need to find the right source book of rare plants.” He blinked. The glare from being out in the boiling sun at the dig hadn’t quite left his eyes. It was as if it were following him around—an in-your-face searchlight, the penalty for disturbing the dead queen. He didn’t believe any of that malarkey anyway, still was there a germ of truth in it somewhere? Miles shook his head. The blinding haze held him captive and he had more work to do. He had made a major discovery and he had to keep going with it. Ajib sat at the table and started fidgeting with his camera at the table. Miles strained to look over Ajib’s shoulder. Ajib pushed the notch to “Display” to view the pictures he’d taken at the tomb, and waited. Nothing; as in no pictures. Just a blank where the pictures should have been. Miles frowned. “I thought I heard you clicking away. Where are the photos?” he asked. Miles shook his head. He could offer no explanations either. Ancient mummy curses were too corny to believe in this day and age. But where were the photos? “You didn’t delete them by mistake, did you?” Miles asked, then regretted it. Ajib was the poster boy for professionalism. Carelessness was not something you ascribed to his mode of operation. “No. I created a file just for these photos so they wouldn’t get lost,” Ajib said. He laid the camera back on the table and wiped his face with a large, cotton handkerchief. “Well, we’re going back there early tomorrow. You can take more photos,” Miles said. Ajib seemed somewhat shaken by the disappearance of the pictures he had so painstakingly amassed. He didn’t say much but stared glassily at his camera equipment as if he believed it had betrayed him somehow. Early next morning saw both Miles and Ajib at the excavation site. Armed with equipment and bottles of lukewarm bottles of water, they crawled into the cavernous hole that even a beggar wouldn’t call home. The sarcophagus stood waiting for them in the dark, dusty corner where it had sat for millennia. Miles set his bags down on the sandy floor of the tomb and took out his brushes. He bent over the sarcophagus and started brushing away the dust from its patina as delicately as possible using the finest of brushes from his collection. It was as if he didn’t want to disturb the mummy’s repose, but it was his life’s mission to bring the artifact to light. The mask on the sarcophagus had intrigued him from the day they had discovered the tomb, but today there was a change in—what was it—the expression of the face? It showed a slight distortion in its mien; almost a look of utter disdain. The face distended into a rictus, a self-contented sneer, as if its owner knew something denied to Miles and his cohort. The two men stared at it, dumbfounded. “The mask,” Miles said in a hoarse whisper. “It looks different. Do you see it?” He was too aghast to sift through all the possible causes, one of which may be that they just didn’t notice it before being busy with cleaning away the debris surrounding the sarcophagus. “It looks insane,” Ajib said. In the eerie glow of the strobe light he carried the tomb and the mask looked surreal. Miles couldn’t make any sense of it. For the first time, he wanted to finish the excavation, hand over the sarcophagus to the Antiquities Council, and go home. Ajib started setting up his camera equipment. “You’re going to try taking photos again?” Miles asked, looking up from the wooden paneling of the sarcophagus. “Yes. Again. Let’s see what happens this time. Maybe I deleted the photos by mistake.” Obviously Ajib was beginning to doubt his professional prowess. Miles took out a sketchbook and started to pictorially document the items in the near vicinity of the sarcophagus—potsherds, faience beads of no general color, drinking mugs, and small stools. He used a whole page to sketch the sarcophagus with the mask, now grotesque in its grinning repose. How would he explain this to the Antiquities Council? Miles was sounding his death knell by submitting a drawing of this. But if the pictures that Ajib was so laboriously taking didn’t show up again, they’d need some evidence and cataloguing of their discoveries. The only thing he didn’t document was the seeds. These he intended to keep for himself. Four miserable, sweltering hours later, working in 130-degree heat, with sweat pouring down their forehead, the men finished up their work. It was too difficult to continue. Miles’s eyes felt watery and hazy again. He was concentrating too hard on the drawings. Enough was enough. He had spent months at the site trying to identify the mummy, and he had finally succeeded. It was time to leave in more ways than one. “Check the photos before we leave,” Miles said. Ajib clicked on “Display.” Nothing. “No pictures,” Ajib said, his voice cracking. “I don’t understand it.” He put down the camera and hit his fist against the red, sandy wall of the tomb. It wasn’t like Ajib to put his fist through the wall. He was usually placid and meticulous. Dr. Hadi Mahmood, Director of the Antiquities Council, a rotund and volatile man, jumped in apoplexy when informed that no photos of the newly-discovered tomb had materialized. Miles and Ajib were in the holding area for new artifacts at the Cairo Museum where the workers had trucked in the sarcophagus and the supporting items carefully from the excavation site. “What do you mean, no photos?” Mahmood roared, his large belly undulating like waves on the ocean. “They have to be sent to the media.” He turned to Ajib. “You could have requisitioned one of our freelance photographers” he bellowed. “Photos just don’t disappear,” Mahmood said looking like a gorilla deprived of his noonday snack in the wilds. “The heat and the humidity at the site could have destroyed them,” Miles said. “What? You can’t believe that?” If Mahmood got any angrier he’d have a stroke, Miles thought. “I have sketches of them,” Miles said, and handed them over. Mahmood shook his head as he took them from Miles with a flourish. “The mummy is safe at least,” he said finally. He didn’t say anything about the grotesque expression on the face. Mahmood hadn’t seen the sarcophagus before the facial expression changed so he wouldn’t know the difference, Miles figured. Miles filed the necessary papers with the artifacts, identifying each of them except the seeds. He was going to plant them in a pot when he got home. Miles let himself into their ranch-style home. It was a sweltering day and someone sure had neglected to turn on the air. He dumped his bags in the hallway and went looking for Elaine. He’d emailed her and she should’ve been somewhere in the vicinity welcoming him home. He’d told her he’d be home soon, hadn’t he? He kicked off his sneakers and padded around in his socks looking for Elaine. Looking for Elaine—he grinned wryly. If that wasn’t a metaphor! Had he really ever discovered her? That done, he brought his bags into the bedroom and then peeked into the den. The PC stood on the desk waiting to be turned on, but he wasn’t going that route. Enough work. He wanted his life back, and Elaine too, if she was around somewhere. Miles decided to fix himself something to eat. He found cold cuts, wheat bread and mustard and mayo, and a carton of milk in the refrigerator. Elaine had thoughtfully left some staples. He poured himself a glass of milk and slapped together a sandwich and munched on it. He felt much better after his snack. But something was missing. The air. He turned on the system and threw himself on the vinyl sofa in the den. He must have dozed off. When he awoke, he groggily saw someone standing in front of him. “Elaine! Where’ve you been?” Miles said struggling to sit up. He shook his head as if he was still trying hard to wake up. “Well, this is some homecoming,” he said. “If you only knew how lonely it’s been these many years,” Elaine said. “You were never around to talk,” she said reproachfully. “Is there someone else?’Miles held his breath. Miles didn’t want to know who it was. If Elaine was leaving, so be it. All he wanted was to get some sleep…for days. Then maybe his head would clear so he could think clearly. Elaine disappeared as suddenly as she had appeared in front of him, obviously not at all bothered by remorse of leaving. His hand went to his head. It hurt too much to cajole her into reconsidering her decision. Besides, it wouldn’t work anyway. After she left, Miles fell back on the sofa and drowned himself in sleep again. This time he was ambushed by the nightmare of the headless mummy lunging at him. He was suddenly jogged out of his sleep, not knowing where he was for a moment. He could have sworn he was at the mummy’s tomb. His face and body broke into a sweat and his head hurt even more than before. A shower—a cool shower—that’s what he needed.He peeled off the sweaty clothes he’d worn for two days and savored the flow of cool flow of water cascading over him. An hour later, feeling better, he unpacked his bags. He found the seeds and laid them on the table in his bedroom. Tomorrow he’d find a pot and plant them and see what came up. It was several days before he found a planter in the shed and bought potting soil to plant the seeds. He then took it to the den and set it by the window where the sunlight poured in. More days flew by…days filled with writing reports on the excavation site, replying to emails from Dr. Mahmood in Cairo. Mahmood seemed pleased with the press that the discovery was getting. It’s all yours, Miles thought, take all the credit. I want no part of it. It must have been because his own life was spiraling downward or maybe the sarcophagus seemed so baffling that nothing seemed explicable. At least Ajib was as normal as can be. Or was he? None of it made sense to Miles. Ajib was the nicest guy he had worked with, and the sanest. He shook hands with the guy in as civil as manner as Miles could summon even though he wanted to belt Roger and knock the smug look on his face. Miles didn’t answer that. “Well, are you here to pick up more of your things?” he asked, wanting them out of his house as soon as possible. “Okay.” Miles went back to his papers. The mummy was soon to be displayed in Cairo, U.S. and Canada, and Mahmood had sent Miles the details of the tour and the promotions. Elaine and her boyfriend left after an hour or so of back-and-forthing and Miles hoped never to see Elaine again except through a lawyer. Two months went by and Miles got ready for another excavation. This time to the Sudan where a remote and forgotten tribe had established its civilization, only to disappear mysteriously after one thousand years. He found what he was looking for in one of the electronic databases of the university library. He’d forced himself to drive there and spent three hours on the computer, making his eyes ache more than ever. The plant was of East African origin and was called Adenia Volkensii (passion flower) and contained a cyanogenic glycoside and a phytotoxin, and the blossoms resembled a cobra hood. Some African tribes used this poison as hyena bait. Miles’s fascination with the plant grew more intense. 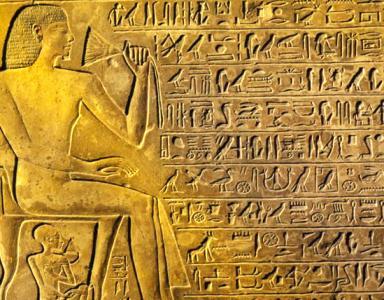 He rummaged among his notes to look for the pictographs of the hieroglyphics he had drawn so carefully. The pictures told him more of what he wanted to know. He had missed it before in his hurry to race against the soaring temperature in the tomb. Nilofer was depicted as trying poison the pharaoh Smenkare with the help of her lover, using the insidious plant—and she had nearly succeeded until the Pharaoh discovered the plot and banished her into the desert and certain death. The seeds had been placed in her hand as a testimony to her treason against the Pharaoh. Miles blinked as he threw the pictographs back into the pile and dragged himself back to the sofa. What evil had compelled Nilofer to orchestrate her doomed plot? He noticed that the plant had grown to a height of one foot, and small white blossoms were starting to push through. He stared at it dumbfounded. He hadn’t expected the seeds to germinate. He had to find out what the plant was. As the flowers blossomed, they sent out a strong but pleasant fragrance and it fascinated Miles. He had never known of any ancient seeds that grew into a plant, and he kept a close watch on the plant. He didn’t know if it was the strain of preparing for the new expedition or the weather that made him drowsy and tired each day. He felt worse by the day but he didn’t want to see a doctor. He couldn’t afford to slow down now. Elaine opened the door and found Miles unconscious. She tried his pulse, but couldn’t feel anything so she called ER at the hospital. “Probably air freshener,” Roger said. While they waited for the ambulance to arrive, they went into the den and found a pile of drawings and papers. “I don’t know what all this means,” Elaine said sadly. Her voice faded and her eyes pricked with tears as they waited, the smell still overpowering. She began to feel drowsy and rested her head on her boyfriend’s shoulder, who was slumped against the couch. 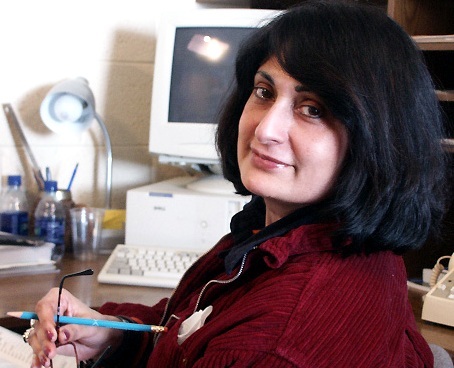 Rekha Ambardar has published over 100 genre and mainstream stories in print and electronic magazines. She is also the author of two romance novels published by Whiskey Creek Press and Echelon Press. She was Associate Professor of Marketing at a university in Upper Michigan, and is now writing full time.